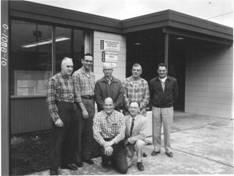 Yamhill Soil and Water Conservation District “district” was organized on April 2, 1953. The first Board of Supervisors included Stanley Christensen, Frank Geisler, Aubrey Tangen, Ivan Dent, Louie Magee, Jack Shelbourne, and Rex Brown. Aubrey Tangen was elected as the first chairman of the district and served until the following annual meeting, at which time Stanley Christensen was elected chairman and has served in that position until he stepped down in 2004. The initial focus of the district was to provide technical assistance on drainage, irrigation water management, and woodland management. At that time, the district had no local funding, and technical assistance was provided primarily by the USDA Soil Conservation Service. In 1979, the district sponsored one of its first significant, public improvement projects – a streamside protection project (under Public Law 216) with funding of over $2.5 million. The district carried the project to a successful completion, which helped many landowners with control of destructive stream bank erosion in the Yamhill River watershed. 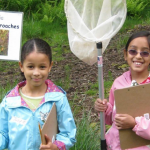 The district launched its first support of outdoor school in the county in 1961. The Cruickshank Woodland Tour was started in 1970 in cooperation with the Extension Service and others. Over 60 years later, the Woodland Tour continues as an important annual signature event – occurring each May on the Cruickshank’s Three Oaks Farm near Dayton. In the 1960 and 1970s, subsurface drainage was a focus of farm and conservation programs. Over 2,500 miles of field drainage tile were installed under various cost-share programs in cooperation with the district. During the 1980’s, focus of local and federal programs changed, and protection of wetlands and highly erodible soils became a priority under the 1985 Farm Bill. In the late 1980’sthe district began working more on conservation activities that focused on reducing soil erosion and protecting water quality. With the increasing focus on water quality protection and other conservation priorities, the district board recognized the need for technical capacity and having locally-funded staff to assist landowners and managers with conservation planning and projects. In 1984, the district board voted to submit a ballot measure to Yamhill County citizens, and successfully gained voter support for the passage of a local tax base – the first in Oregon. The tax revenues allowed the district to hire staff, support local programs, and leverage various state and federal grants. In 1990, the district sponsored its first plant sale by providing a few hundred seedlings for local projects. More importantly, the district and its conservation partners started a dialogue with the public about the importance of using native plants in Yamhill County – for conservation projects, riparian areas, wildlife habitat, and other landscapes. The district’s native plant sale continues to be an important annual event – one that is anticipated and heavily supported by the members of our community. Over one million plants have been distributed through the district’s native plant program since the program began in 1990. Over the last two decades, the district’s programs and services have continued to evolve. Incorporating land protection strategies through the use of conservation easements is just one example of a newer program area of involvement. In 2002, the district agreed to hold its first conservation easement for Crown Hill Farms to ensure their property is preserved for agricultural, forestry, and watershed protection in perpetuity. In 2003, Frieda Miller bequeathed 131 acres at Miller Woods to ensure long-term protection of the land for sustainable forestry use, provide a venue for outdoor education, and offer a location for the public to experience nature. For over 60 years, natural resource conservation issues, priorities, and management practices have changed. The district continues to develop new approaches and methods to deliver technical assistance and education and pursue new conservation opportunities and strategies to meet the needs of the community, and protect local natural resources. Our district looks forward to partnering with you in the future. The “Dust Bowl” brought to the nation’s attention the need to conserve soil and other natural resources. In 1935, President Franklin D. Roosevelt addressed the problems of soil erosion in the nation by shepherding the passage of the Soil Conservation Act, which established the Soil Conservation Service (SCS) within the United States Department of Agriculture (USDA). The SCS was charged with developing a program to conserve and enhance the nation’s soil and water resources. At first, it was assumed the federal government could manage the whole program. However, during the first two years, it became apparent local leadership was needed to coordinate efforts of conservation agencies and tie their programs to local conditions and priorities. The SCS needed the assistance of local farmers, ranchers, and other land managers to put together and operate an effective program. In 1937, President Roosevelt asked all state governors to promote legislation to allow the formation of soil conservation districts. During the same year, Congress developed model conservation district law for consideration by state governments. Thus began a partnership that exists today. 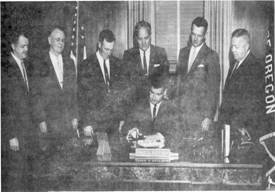 In 1939, the Oregon Legislature passes legislation to establish conservation districts in Oregon. Conservation districts were charged with directing programs to protect local renewable natural resources.